NH Federal Status: Not listed; Bald eagles are legally protected in New Hampshire. Possession and take (which includes harming, harassing, injuring and killing) is illegal. Distribution: Bald eagles are present year round in NH with pairs breeding and raising young in the spring/summer and many wintering in areas with open water such as Great Bay. Description: 3' tall with a 6-8' wing span. Females weigh up to 14 lbs; males weigh 7-10 lbs. 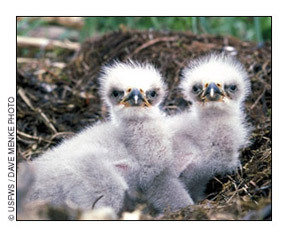 Immature bald eagles are mottled light brown, tan, and white until age 3 or 4. They have brown eyes, a black beak, and yellow feet. Adult bald eagles have a distinctive white head and white tail feathers, and a dark brown body and wings. Their eyes are pale yellow and the powerful beak and unfeathered feet are bright yellow. Video footage from North Woods Law: New Hampshire. Voice: Weak, high-pitched, chatters or whistles. Commonly Confused Species: Immature bald eagles can be confused with golden eagles or osprey. 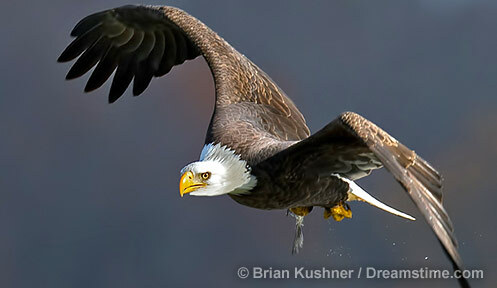 Habitat: Bald eagles breed in forested areas near bodies of water and winter near open water (i.e. coastal areas, rivers, and lakes with open water). 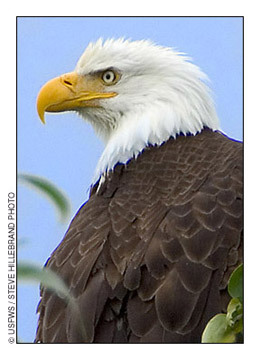 Nesting: Bald eagles can live up to 30 years old and can begin breeding between 4-6 years of age. They build large nests in tall trees near the water’s edge. Females lay 1-3 eggs in March - May. Both the male and female incubate the eggs and young hatch after five weeks. Bald eagles often retain the same mate for many years and reuse the same nest from year to year. Diet: Primarily fish; occasionally other birds, small to medium mammals, turtles and with carrion.